The Master Lock No. 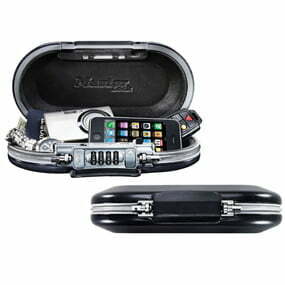 5900D SafeSpace® Portable Personal Safe features durable construction made to withstand abuse and is water resistant. The safe measures 2-1/5in H x 9-2/5in W x 5-1/10in D. It is ideal for recreation, campus, office, travel or leisure use. The safe includes a cable to wrap securely around a fixed object or use as a carrying handle. Set your own combination. The Limited Lifetime Warranty provides peace of mind from a brand you can trust.